British scholar Stuart E. Mann (1905-1986) was born in Nottingham and studied at English schools and universities. He graduated with a degree in Germanic philology from the University of Bristol in 1927. In 1929, he travelled to Albania on a ferry from Brindisi in order to learn Albanian and familiarize himself with the culture. He got a job in Tirana as an English teacher at the American Vocational School run by Harry Fultz and stayed in the country until 1931. 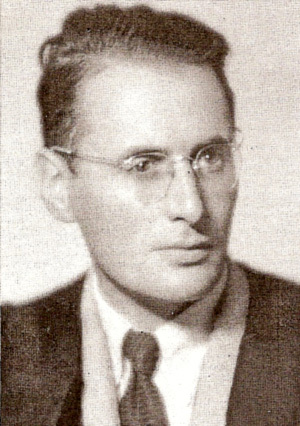 In the 1930s, he later taught English at the Mazaryk University of Brno in Czechoslovakia. Mann returned to England during World War II and worked for the Information Ministry and subsequently for the Foreign Office. In 1947, he also became reader in Czech and Albanian at the School of Slavonic and East European Studies of the University of London, where he worked until his retirement in 1972. Stuart Mann's primary interest in Albanian studies was in phonology and language history. Among the main Albanological publications are: "A Short Albanian Grammar," London 1932; "An Historical Albanian-English Dictionary," London 1948; "Albanian Literature, an Outline of Prose, Poetry and Drama," London 1955; "English-Albanian Dictionary," London 1957; and "An Albanian Historical Grammar," Hamburg 1977. He was also the author of numerous articles devoted primarily to Albanian language and literature. In this delightful paper, he reminisces on his first contacts with Albania. Stepping out into Albania forty years ago was like stepping into another world. Across the Adriatic I went by packet steamer from Brindisi, in the heel of Italy, to Durrës, the main port of Albania. Albania is a very small country, only a little larger than Wales, but with a language of its own, and this is the language I wanted to learn. Although Albania is only 180 miles from north to south, there is a large Albanian colony in Yugoslavia, so that the language spreads well beyond its frontiers. But I won't bore you with geography. What was so odd to me, a postgraduate from Bristol, was to find myself in a Moslem world in Europe. The townswomen were veiled in black from top to toe, so that you could not tell which was the front and which was the back when they stood still. The countrywomen wore gayer clothes, and the Catholic women were unveiled. If you saw Moslem women walking in pairs or threes with a man in front, they were his wives. Babies were carried strapped tightly to the bottom of wooden cradles to flatten their heads, because long heads were considered ugly. They rarely breathed fresh air, for they were kept covered with a piece of carpet for fear of the evil eye. No wonder half of all Albanian babies born forty years ago died in infancy. The others grew up amid endemic diseases such as malaria, and the mortality rate was high. From Durrës, the port of landing, you had to hire a car, and this was done by haggling with the driver in a public square. Children as well as grown-ups knew all about cars and aeroplanes; none had ever seen a train unless he had been abroad. You couldn't travel by train because there weren't any, nor was there any coal to drive them. In fact, few people had ever seen coal. Tirana, the new capital, was new only in name. Converted from a village, it had no drains, no water supply, no gas and no public transport. 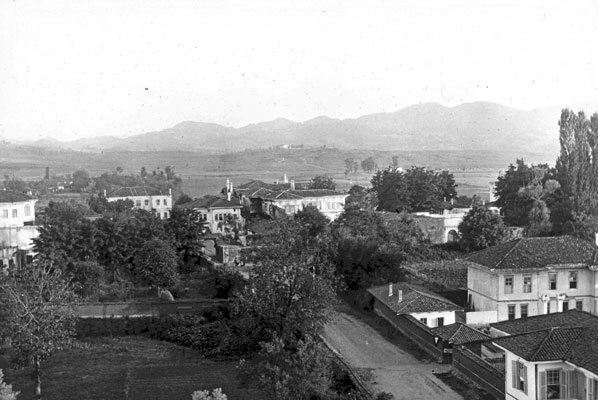 Tirana was typical of most Albanian villages. Four hundred and fifty years of Turkish rule had left it a deserted and forgotten backwater, with dirt tracks for roads, and mud-brick houses for dwellings. While the Roman Catholic church struggled on in the north, the Greek Orthodox Church had a rather larger following in the south, but overall lay the dead hand of the Moslem world, and seventy percent of Albanians were of Moslem faith. But there was no religious strife. All Albanian children went to the same school and learnt to sing the same national anthem, a song in praise of Zog, who had made himself King of the Albanians just a year before I arrived. I shall be returning to this strange figure in a moment. The streets of Tirana were of dust or mud, according to the time of the year. The newspapers used to say you could grow rice in them. You were made aware of the streets every time an Italian car rushed past. Only the Italians, mostly engineers, had cars. The Albanians rode on donkeys. I well remember the day when Albania first imported bicycles, the first ever seen in the country. There was a rush to buy these strange machines, and their new owners, trying them out for the first time, wobbled and fell, or ran into each other, amid the laughter of passersby. Soon after this, they imported straw hats from Italy. Now the Italian head is long. The Albanian head is round, since they are moulded that way in infancy. The outcome was obvious. The hats would not fit Albanian heads and had to be returned. Mussolini was angry, but Tirana laughed, and straw hats were not seen again for a long time. Telephoning was a joke. One single wire linked Tirana with the port of Durrës and the outside world. Another went to Shkodra in the north. Two others went south. Telegraph poles were expensive and would have to be imported, so the Albanians stripped live trees every few hundred yards and stuck a knob on top. In spring the telegraph poles sprouted leaves and interfered with communication. The central telephone exchange was housed in a disused cowshed with a well outside, which stood in the middle of a cobblestone farmyard. It was operated from an old-time switchboard with a winding handle at the side and was guarded by one old man in a fez, who had almost nothing to do, since Albanians rarely telephoned. When they, or I, did so, we asked for people by name. There were no numbers. The old man enjoyed his sleepy job, and passed the time drinking strong coffee and smoking cheap cigarettes, costing twopence for twenty. Electricity came to Albania in 1926 by an unusual route. The American Junior Red Cross agreed to build a high school for boys if Albania would pay half the cost, as well as half the salaries of the teachers. The government agreed, even though the annual budget for the whole country, its defences, public works, education - the lot - only amounted to a million pounds. There was no national health, and there were no hospitals. One could hardly run a hospital by drawing water from a well. So the new school slowly went up. It was a plain building in concrete, built by the boys, who were helped by the teachers who got no extra pay for their work. This arrangement cost the Albanian government nothing, except for the materials, an arrangement that would have delighted Mr Samuel Squeers. When I came for a job at this school, I asked one of the boys if I could see the headmaster. "There he is," came the answer in passable English. He was pouring concrete into the foundations of a new dormitory. "Do you want somebody to teach English?" I asked. "Yeah, I guess we do. You're on. Half your salary comes from us, the other half from the Albanian government." Without looking at my credentials, he took me on the next day. At the end of the month I was paid in gold, mostly sovereigns. On later occasions I received an Albanian four-pound piece, the heaviest lump of gold I have ever acquired. But this is where the electricity comes in, not for heating, for this was done by a charcoal brazier standing in the middle of the room. It was decided that oil lamps were not suitable for the new school. A Petters engine was imported from Yeovil in Somerset. Several barrels of heavy oil were rolled into the basement and the miracle took shape. There was light. At first the school lamps were dim, and flickered with every thud of the engine, which could be heard amid the teaching, though it was down in the basement. In Tirana rumours spread fast. The miracle was admired by Zog's ministers who, having little else to do, paid the school a visit from time to time. At length, the miracle of electricity came to Zog's ears. Bored with his palace, where he sat smoking and drinking endless coffee, he came over to the school to look at the boy's exercise books, and to try to judge their progress in English, a language he did not know. It was dusk; the flickering lights came on. Result: we had to put in a power line from the school to the palace. The school lights flickered more than ever. Next year an Austrian firm put up a power plant for the town and our worries were over. When the town lights came on for the first time, everybody swarmed out to see them. Prayers of thanksgiving were offered in all the mosques of Tirana. But the installation of a power plant did not solve all our problems. In my hotel were the only two bathrooms in Tirana. They were served by artesian wells sunk into the hotel courtyard round which it was built. Baths had to be booked a fortnight ahead, and cost half a crown a time. I was told I couldn't have a bath for a month because the Prime Minister and his cabinet had booked them for the whole of the period. So I learnt to wash myself from a basin and ewer in my bedroom. Early in my stay I went into the hotel lounge on the second floor and saw an extraordinary sight. A learned-looking man in pince-nez glasses was writing a letter from right to left. After folding it, he clapped his hands and in a moment his servant-boy appeared. The boy addressed an envelope for him, and the man sealed it. The man could only write Turkish, and this he did in the old Arabic script. He could not write Albanian. After the boy had gone, he asked me who I was. I told him and then asked him who he was. "I'm the Prime Minister," he said. After a short conversation he left the hotel lounge, holding a long silver-knobbed ebony stick in his right hand like a crozier, and spitting on the steps, alternately to right and left as he went down. A solemn retinue of men followed him to show how important he was. The other members of the cabinet could be seen on most days walking down the middle of the main street, taking sly sideways glances to see that none got a single pace ahead of the others. That would have indicated precedence and would have put the others to shame. The king's birthday was both a holiday and an ordeal. On this occasion shots would be fired into the air, and then the whole Albanian army would file past, its mules loaded on each flank with shrapnel and its commanding general at its head, jogging uncertainly on an extra-large horse that had to be imported for the purpose. Then came the navy: forty-five men, with one admiral who marched alongside trying to keep them in step. After the parade the dust took an hour to settle. At the end of World War I, the Albanian navy consisted of two old single-funnelled ships, one afloat, the other down at the stern. They stood grey and forlorn in Durrës harbour, which was largely silted up and unusable. Sometime later these two ships, the whole of the Albanian navy, were offered for sale in a glass case outside a Tirana bookshop, at £ 200 a piece. There were no takers. Talking of books leads me to one of the saddest stories of Albania's backwardness because it is one of the most heroic. Up to the fifteenth century, Albania was a Christian country, with a language and literature of its own, and its books were written in Latin characters. Then the Turks broke into the country, ravaged its churches and schools and left it a desolate and blighted backwater for nearly 450 years. The language continued to be spoken, but books were forgotten, and only one survives, a litany written in 1555 by one John Buzuku, a facsimile of which I have brought with me to show you. In 1878, Albania tried to break away from Turkey, but in vain. The writing and publishing of books became an underground movement and every writer chose a spelling of his own. Schools were opened and closed again for fear of sedition. At last, in 1908, Albanian writers summoned a congress at Bitolj to settle the question for an alphabet. Of twenty alphabets three were considered. After a lot of argument, one delegate stood up, held up a typewriter and said, "Get all your Albanian characters onto this typewriter and the language will live. Bring in a lot of new characters and the language will die, because nobody will be able to print it." His simplified alphabet won the day. But I am talking of the Albania of forty years ago, when country brides, not town brides, were auctioned by their fathers to the prospective son-in-law. At such an auction, preceded by a feast of food and drink provided by the bride's father, the father would sit at one end of the table with his daughter, discreetly veiled, while the future son-in-law would sit with his male friends at the other. When the party had become sufficiently softened up with rakia, the fun would begin. "What will you give me for my daughter?" the father began. The boyfriend would form a huddle with his friends and they would confer in whispers. "Five sovereigns," came the answer from the other end of the table. "Nonsense," from the father, amid laughter. The barter price would reach 250 to 300 sovereigns, according to the worth of the daughter as a housewife and farm worker. The deal was clinched by more drinking, and the gold would be handed to the bride's father in a leather bag. After the wedding ceremony, the bridegroom would often see his bride for the first time. She was now his chattel, and she would henceforward walk behind him carrying his loads, while he road in state sidesaddle upon a donkey. Albania today is not the same country as it was forty years ago. Still the poorest country in Europe, it now has railways, steam propelled, hydroelectric power, textile mills and an oil refinery. But the average wage is still only £ 1 a week. There is chronic shortage, and only privileged communists have a car. As such, there are few traffic problems. There is a fine university with four faculties. Religion has been abolished, and the whole economy is geared to Stalinist Marxism. The marshes have been drained and malaria is a thing of the past. The Albanians are immensely proud of their, by our standards, absurdly modest achievements, but the severity of the communist regime is greater than anywhere else in Europe outside Russia. Content with little, the Albanians remember all too well the days when they had less. The present Prime Minister is, I regret to say, a former pupil of mine, whom I taught when he was only sixteen. His government has twice asked me to go to Albania with all expenses paid, but I have had to refuse, saying, with some truth, that I have no time. This is partly true, but it is not the whole truth.